Yesterday I started my day with a workout, then cleaned our master bath and went grocery shopping. 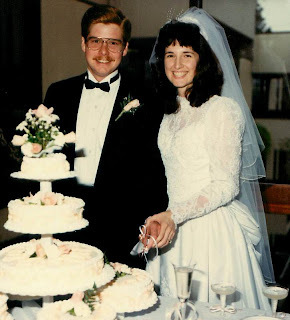 It sounds like an average Thursday—and it was, except for the fact that it was our 25th wedding anniversary. My husband and I celebrated the day by exchanging cards and small gifts, then going to see Les Miserables, a movie we’ve looked forward to since we first saw the trailer months ago. Does that sound unromantic? I admit it’s not a trip to a bed-and-breakfast complete with champagne and chocolates, but we’ve done our fair share of that. After 25 years, we’ve learned that romance is wonderful but it’s not the only thing that keeps a marriage strong. Being honest about needs and wants, putting in the time and effort to keep a home running and income flowing, working together as well as playing together—these things, unromantic as they are, hold a marriage together over the course of a lifetime. Romance is only the beginning. Marriage is acting loving when you’re not feeling that way, forgiving when you don’t think you can, and finding someone who is willing to do the same for you. Just like happiness is not just about “happy” events. My husband and I have built a life, a family, a home together, and that’s worth celebrating in small and large ways. Yesterday we celebrated in small ways—with flowers and chocolates and a movie. Later this year, we’re planning a just-the-two-of-us trip (when we finally decide where we want to go) where we’ll have a little more time for romance. I’m looking forward to it. So young is right. What about a new pic of the two of you? Congrats on your anniversary - sounds like you two know how to make a great marriage. Your day sounds nice to me - I think there can be romance (of a sort) in life's daily activities. Just depends on how you approach them. Your trip sounds nice too - I'll be interested to know where you decide to go. Thanks for the good wishes. I'll certainly write about our trip when we take it. I'm pushing for someplace mountainous, but who knows where we'll end up? It's a beautiful post. Congratulations on your anniversary. You still look as beautiful as you did on your wedding day! Best wishes. Thanks, Claire! I can't believe how quickly the years seem to have passed. You guys are beautiful! Happy Anniversary ... glad that you had a fun date ... how was the movie? Thanks, Kathy. We really enjoyed the movie, though it was a bit exhausting emotionally. It helped to have seen the musical on stage, too.